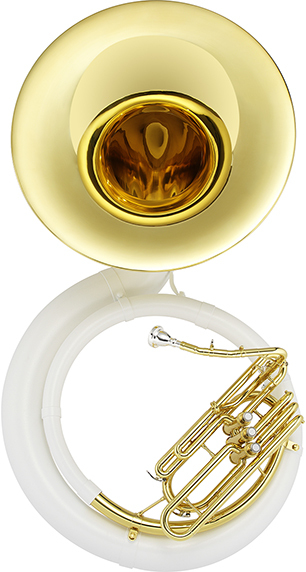 The Jupiter JSP1100 Quantum Marching Sousaphone features a full brass body and bell with a .687 inch bore and 26 inch bell designed for outstanding response and projection. The JSP1100 also features a removable valve body for easy maintenance. Comes with molded ABS case with wheels. 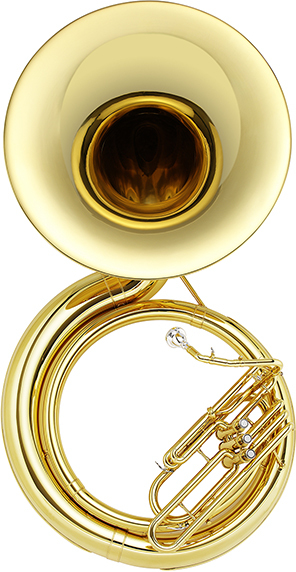 The Jupiter JSP1100S Quantum Marching Sousaphone features a full brass body and bell with a .687 inch bore and 26 inch bell designed for outstanding response and projection. The JSP1100S also features a removable valve body for easy maintenance. Comes with molded ABS case with wheels. 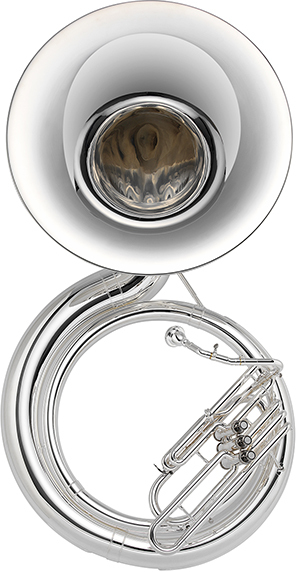 The Jupiter JSP1110 Quantum Marching University Quad Valve BBb Sousaphone combines the benefits of a large bore with a concert tuba-style four valve cluster for a larger sound with less resistance and better intonation. Comes with molded ABS case with wheels. 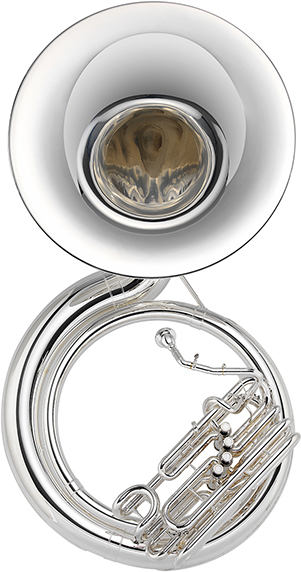 The Jupiter JSP1110S Quantum Marching University Quad Valve BBb Sousaphone combines the benefits of a large bore with a concert tuba-style four valve cluster for a larger sound with less resistance and better intonation. Comes with molded ABS case with wheels. 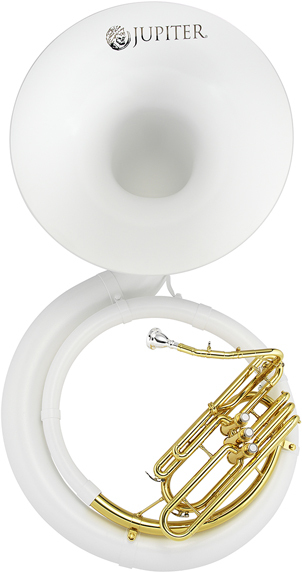 The Jupiter JSP1000 Fiberglass Sousaphone is one of the more sturdy marching instruments currently on the market. The JSP1000 features a durable white fiberglass body with a 26-inch bell for great projection plus an easily removable valve and slide body for easy maintenance. The Jupiter JSP1000B Fiberglass Sousaphone with nylon carrying bag is one of the more sturdy marching instruments currently on the market. The JSP1000B features a durable white fiberglass body with a 26-inch bell for great projection plus an easily removable valve and slide body for easy maintenance. 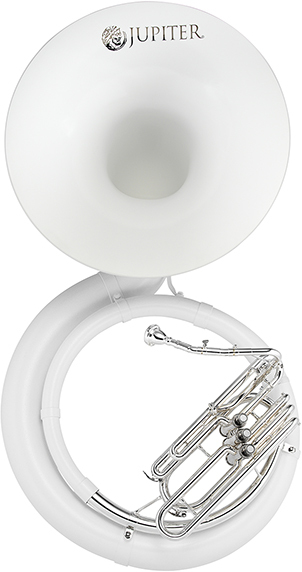 The Jupiter JSP1000S Fiberglass Sousaphone is one of the more sturdy marching instruments currently on the market. The JSP1000S features a durable white fiberglass body with a 26-inch bell for great projection plus an easily removable valve and slide body for easy maintenance. The Jupiter JSP1000SB Fiberglass Sousaphone with nylon carrying bag is one of the more sturdy marching instruments currently on the market. The JSP1000SB features a durable white fiberglass body with a 26-inch bell for great projection plus an easily removable valve and slide body for easy maintenance. 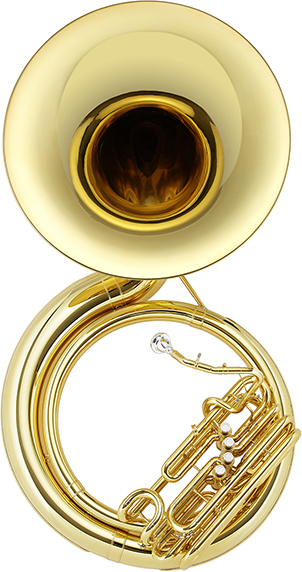 The JSP1010 BBb FiberBrass Sousaphone combines a lightweight fiberglass body with a lacquered brass bell for greater resonance and carrying power. It comes with an ABS case with wheels. 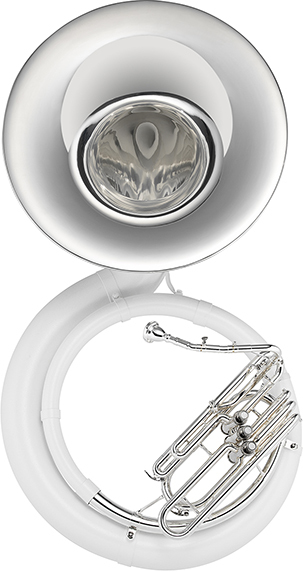 The JSP1010S BBb FiberBrass Sousaphone combines a lightweight fiberglass body with a silver plated bell for greater resonance and carrying power. It comes with an ABS case with wheels.